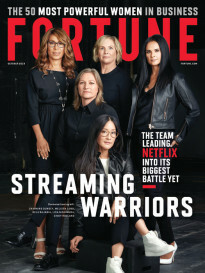 Media conglomerate Time Inc., which owns a stable of magazines including Fortune and TIME, is looking to former Fox executive Rich Battista to help step up the company’s evolution from print to digital. Time Inc. announced on Tuesday that Battista is taking over as CEO effective immediately, replacing Joe Ripp, who became CEO shortly before the publisher was spun off from former parent Time Warner in 2014. Ripp will serve as executive chairman until 2018. Battista, 52, was previously CEO of Mandalay Sports Media, part of an entertainment company financed by Hollywood producer Peter Guber. Prior to that, he held several senior management positions at Fox, and was also the CEO of Gemstar-TV Guide International. 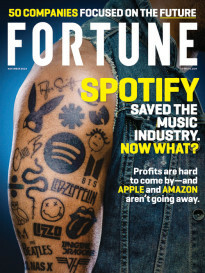 Time Inc.’s new CEO said in an interview with Fortune that he believes the “trusted, quality nature of our brands puts us ahead of some of our digital competitors.” Those competitors include BuzzFeed and Vice, both of which now have private-market valuations that are greater than that of the 93-year-old publisher, which is worth about $1.4 billion. Battista added that while Facebook (fb) is a competitor when it comes to advertising revenue, he also sees the social network as a partner. “Facebook is obviously a behemoth,” the new CEO said. “But they want and need our content, and we believe there are a number of ways that we can partner with them.” He also said that Time Inc.’s brands are better positioned when it comes to native advertising because they are trusted in a way that many digital competitors are not. Ripp, 64, said in an interview that his departure from the top job at Time Inc. was triggered by a “health incident” he experienced recently. He wouldn’t elaborate on what the incident was, but said it accelerated his thinking about succession. Ripp denied speculation that an investment by activist hedge fund Jana Partners earlier this year had anything to do with the timing of the CEO change. The hedge fund now owns 5% of the stock. In his new role, Ripp will continue to receive his $1.13 million base salary through most of 2018. He also will receive a minimum annual bonus of $1.42 million (pro-rated for 2018), according to a regulatory filing. This compensation package sparked some criticism within Time Inc., given the financial pressures on the company, and the fact that it has shed a significant number of employees over the past several years. The former CEO has gotten some favorable reviews from industry analysts for trying to extend the company’s brands into a digital age, through acquisitions like online community HelloGiggles and the launch of a digital-only brand called Instant. Ripp has also faced criticism from both inside and outside Time Inc. for some of his moves at the publishing company, however. Time Inc. acquired a data-oriented advertising company called Viant earlier this year, which Battista said will give the publisher a lot more data on its users. But most of the media world focused instead on the fact that Viant also owns what is left of MySpace, the failed social network. In the Time Inc. town hall, Battista responded to a question about the Jana investment by saying his job was to “create real shareholder value and the rest will take care of itself.” Blending the company’s premium content with the kind of data Viant has will create “a winning combination,” he said. An increase in shareholder value is something many investors in the company would no doubt be delighted to see, not just Jana Partners. At one point earlier this year, Time Inc.’s share price was down more than 50% from the $24 it traded at not long after the spin off in June 2014. The stock has recovered somewhat since then, but at $14.32 on Tuesday it was still more than 30% lower than when it was spun off. The stock dropped by about 1% after the news of Ripp’s departure. The company’s print advertising revenue fell 13% in the most recent quarter, and Time Inc. has had to revise its growth projections downward. Instead of revenue growth of between 1% and 5% for 2016, the company now says it will be between zero and 1.5%. The company had revenues of $769 million in the latest quarter, and net income of $18 million, down 25% from the same period a year earlier. Time Inc. carries an outstanding debt of $1.2 billion. The company’s digital revenue rose by 65% in the latest quarter, but it is still too small a proportion of overall sales to make a big impact. Time Inc. made more than four times as much from print advertising and circulation revenue last quarter as it brought in from digital ads. Like many other traditional media entities, Time Inc. has been under pressure to accelerate its transition to digital as both its advertising revenues and its share price have continued to decline. But it has been hampered by an organizational structure and culture that were created when print publishing was still a huge cash machine. The company recently announced a re-organization that put all of the brands under Battista, who was hired last year and originally given responsibility over People and Sports Illustrated.